Better Than A Billboard & Cheaper Too! 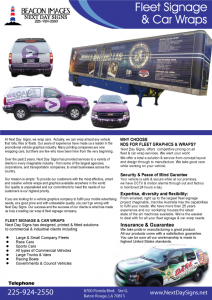 Marketing using vehicle wraps is the fastest-growing for of advertising in the USA. On average, the US population spends two hours per day on the road, so there isn’t a better location to find your target market. Fleet branding and graphics generates up to 70,000 impressions per day per truck wrap and it reaches virtually all demographics. 47% of 18-34 year-old’s surveyed found that car wraps and automotive graphics captured their attention. 96% of people surveyed said that car wraps and gleet graphics have more impact than billboards. Many variables come into play when pricing out a vehicle wrap. We will consult with you to make sure we make your vision a reality from getting your entire fleet wrapped in your businesses branding, to getting the perfect camo truck wrap. We can do boats, trailers and pretty much anything with wheels, and most stuff without! While the price can vary from anywhere between $250 to $3500, the average price is usually around $2000. Contact us today to get your most accurate quote. 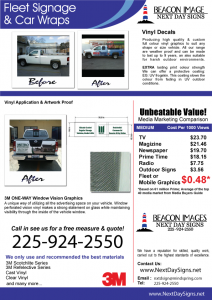 Why Chose Next Day Signs/Beacon Images For Fleet Graphics & Wraps? 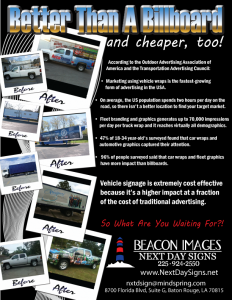 Beacon Images offers competitive pricing on all fleet & car wrap services. We offer total service and solutions from concept layout to design through to manufacture. We take good care while working on your vehicle. Your vehicle is safe & secure while at our premises. We have CCTV and motion alarms throughout and our factory is monitored 24 hours a day. From the smallest right up to the largest fleet signage project imaginable, we have the capabilities to fulfill your needs. We have more than 25 years of experience and our workshop houses the latest state of the art machines available. We take pride in manufacturing a great product. All our products come with a satisfaction guarantee. You can be sure all our workmanship is made to the highest standards. We have a local installer in New Orleans so not only will you receive a fast proof, the highest quality vehicle wrap and the fastest turnaround time, but we will have our local installer come to your home or business and finish the job.